Princeton University Press, 2016, 552 pp. This book brings together some of today’s most exciting scholars of Irish history to chart the pivotal events in the history of modern Ireland while providing fresh perspectives on topics ranging from colonialism and nationalism to political violence, famine, emigration, and feminism. Contributors describe how the experiences of empire and diaspora have determined Ireland’s position in the wider world and analyze them alongside domestic changes ranging from the Irish language to the economy. They trace the literary and intellectual history of Ireland from Jonathan Swift to Seamus Heaney and look at important shifts in ideology and belief, delving into subjects such as religion, gender, and Fenianism. Presenting the latest cutting-edge scholarship by a new generation of historians of Ireland, The Princeton History of Modern Ireland features narrative chapters on Irish history followed by thematic chapters on key topics. The book highlights the global reach of the Irish experience as well as commonalities shared across Europe, and brings vividly to life an Irish past shaped by conquest, plantation, assimilation, revolution, and partition. This book can be purchased directly from the publishers. "The scholarship is formidable: all the chapters are grounded in the most up-to-date research, all are substantial, the best sparkle with original insights ... Vincent Morley provides a heroically concise survey of the Irish language in Irish society from its origins to the present day. It is regrettable that the political ideas and historical consciousness encoded and articulated in Irish – as explored by Morley himself in a number of recent studies – register so infrequently in other contributions to this book." 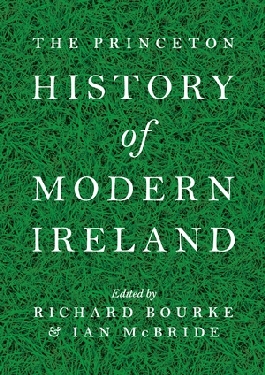 "This superb collection of essays is presented explicitly as a state-of the-art report on historical scholarship by the current, successor, generation of Irish historians ... Like Joyce's Stephen Dedalus, Irish historians can never quite fly by the nets of nationality, language and religion. Some, like Vincent Morley who provides an intellectually rigorous chapter on the Irish language, do not try to do so."